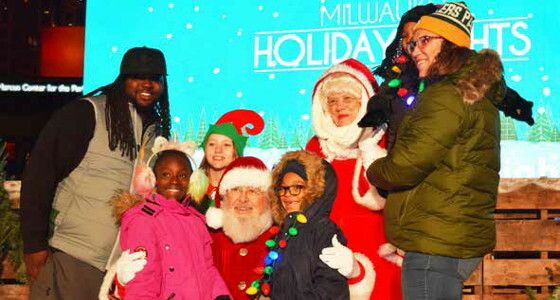 On Thursday, November 15, 2018, Milwaukee Downtown BID #21 hosted Milwaukee’s Annual Holiday Lights Kick-Off Extravaganza to light up downtown’s parks and streets for the 20th season during its switch-flipping ceremony at Pere Marquette Park. Performers in the Milwaukee Holiday Lights Festival Kick-Off Extravaganza included: Platinum, Prismatic Flame, Milwaukee Youth Symphony Orchestra, Jenny Thiel, Young Dance Academy, and cast members from Milwaukee Repertory Theater’s “A Christmas Carol” and Black Arts MKE’s “Black Nativity” presented by Bronzeville Arts Ensemble, and a fireworks spectacular. After the Nov. 15 kick-off, families can view all the decorated sights aboard the Jingle Bus presented by Meijer. Riders can hop aboard at the Plankinton Clover Apartments, 161 W. Wisconsin Ave., from 6 p.m. to 8:20 p.m., Thursdays through Sundays, until Dec. 30. Rides are just $2 per person, cash only, and parking is available in the attached structure for $3. Please note the Jingle Bus will not operate on Thanksgiving.